Some jaw-dropping beach volleyball was played on Court 2 tonight. 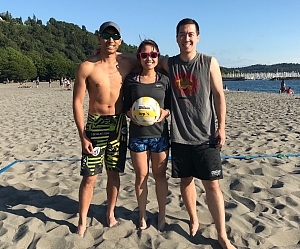 With only three players, ATC used their impressive athleticism and volleyball skills to beat out their toughest competitor. Winning that first set was not easy, but ATC took advantage of a few missed serves to sneak ahead. While their opponent could hit like maniacs, ATC was ready on defense on the other side. As one player put up a strong block, the other two were low and on their toes to dive wherever necessary. Strategy was key, and ATC followed through with win. The second set contained long rallies and jaw-dropping saves from both competitors. It came to a close as ATC cut a hard angle on an attack and left their opponents in the dust. But with great volleyball also comes great friendships! Both teams played fantastic, and their players of the week were awarded to everyone for all of their hard work and for such a great season! Congratulations to ATC for the championship win! Bump n Grind Bumps n Grinds to the Top! What an exciting match! Both teams in the championship played their best game all season. Early in the game, both teams put up a spectacular offense. All of their rallies were long nail-biters! Bump n Grind were the better bumpers to win the first set. Continuing in the second set, Bump n Grind stayed on their toes, and despite their opponent’s impeccable placement, Bump n Grind hustled to the ball and made some fantastic saves. Their hustle and perseverance allowed them to rise to the top to victory. Congratulations to Bump n Grind, our champions! And thanks to teammates’ parents for attending and cheering them team on! We love it when Indy teams stick together! Last season, this group started as an Indy team, and as soon as they renamed their team to Incrediballs, there was no stopping them. Their opponents put up a fight as it was fairly back and fourth in the first set. A player on the opponent side had a power underhand serve, which caught Incrediballs off guard, but they powered through with some incredible serve of their own, and won the first set. The second set was just as difficult as the first, with all players giving their best hustle. 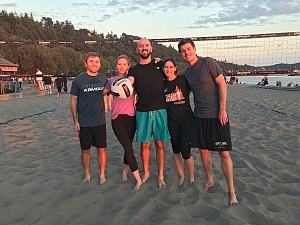 But Incrediballs hustled just a little harder and pushed to a triumphant win. Excellent sportsmanship by both teams. 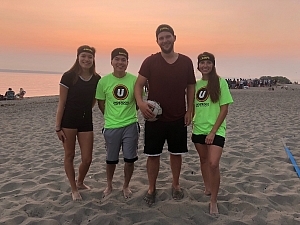 Congratulations to our champions, Incrediballs! Wow! There was some serious competition going on tonight. Each set was incredibly close, but Notorious DIG edged out the competition with their notorious hustle. The first set was very back and forth, as Notorious DIG used their best servers. In defense, their opponent was scrappy. They perfected saving the ball out of the net, which was impressive. Yet Notorious DIG snatched the first win by better covering their back corners. The second set was just as close as the first one. As soon as one team had a run, the other team stole the point and caught up again. Both teams gave it their all, but Notorious DIG remained at the top, and earned their spot as champions. You can tell that both teams enjoy playing each other, for their positivity and competitiveness is undeniable! Congratulations to our champions, Notorious DIG!